These simple spiders and bugs are very quick and easy to make. Miss 3 did most of the work herself! Punch holes in toilet rolls to allow pipe cleaners to fit. Paint toilet rolls, allow to dry. Insert pipe cleaners into holes (fold over ends so there are no sharp bits). Glue on googly eyes. Shape pipe cleaners so they look like legs. Notes... My toddler and I made these very easily. We had all the items at home. You could add extra things to the bugs if you like. I’m headed to the shops today. Will buy some pipe cleaners and googly eyes! How great are these, I love the spider legs! Encouraging recycling in such a fun way is so important. Thanks for an interesting project. Should be loved by many. I love that we can make these with things from around the house. A very cute and fun idea that is budget freindly,thanks! What fun. I think in our house they would be aliens and monsters. No matter what name they go under they do look like fun to make. Thank you. I wonder if this would help our youngster overcome his fear of spiders. He only has to see an old web and he freaks out. He won’t go near where it has been even when he knows it has been removed. I love recycling bits and pieces from around the house. These are a cute activity, and will be a change to our normal ‘toilet roll binoculars’ phase we’re in at the moment. They look very good. My daughter used to make a lot of these crafts when she was younger!! Cute little googly bug and spider! 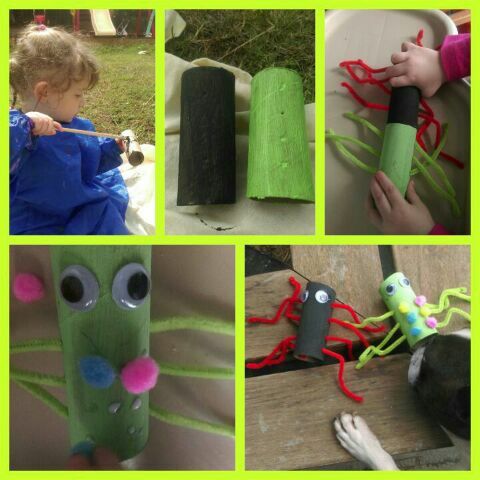 There are so very many uses for toilet rolls – very cute critters you have created here. Love loo rolls for arts and crafts.